Harbin(哈尔滨) is a city in Northeast China with a heavy Russian influence. Around 1913 the first generation of Russian immigrants came mostly to work for the Chinese Eastern Railway, since then they left noticable marks on local culture, one of which is : 大列巴(pronounced: Da Le Ba). 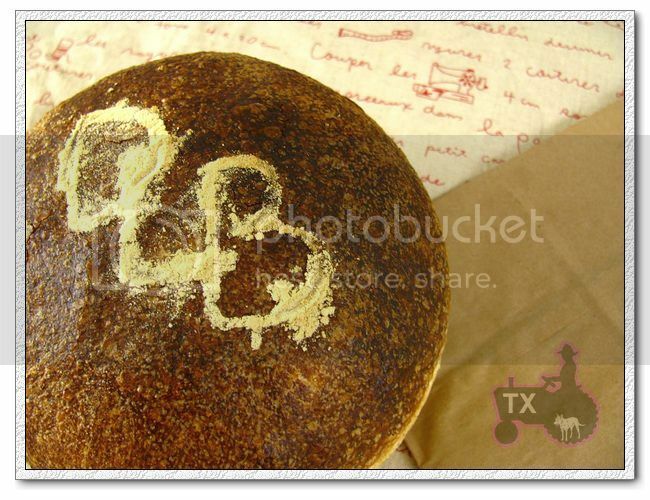 This is a miche like sourdough bread that' was first introduced to the locals by a Russian baker, and has been sold in Harbin bakeries for over a hundred years. Even its Chinese name was originated from Russian word khleb (bread). 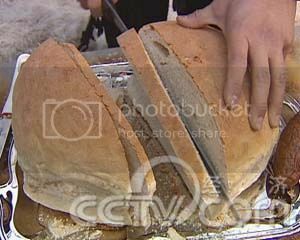 The fact that this bread was accepted and welcomed by Chinese people, even became a famous "traditional Harbin food" is very interesting since its sour and chewy taste is decidely different from other traditional Chinese foods. 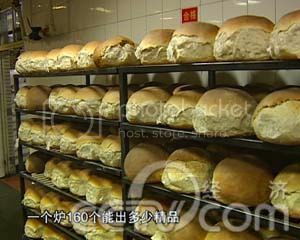 In recent years many bakeries have been opened all over China, but they mostly sell soft and fluffy Asian style breads, very few sourdough breads, nothing at all like 大列巴. 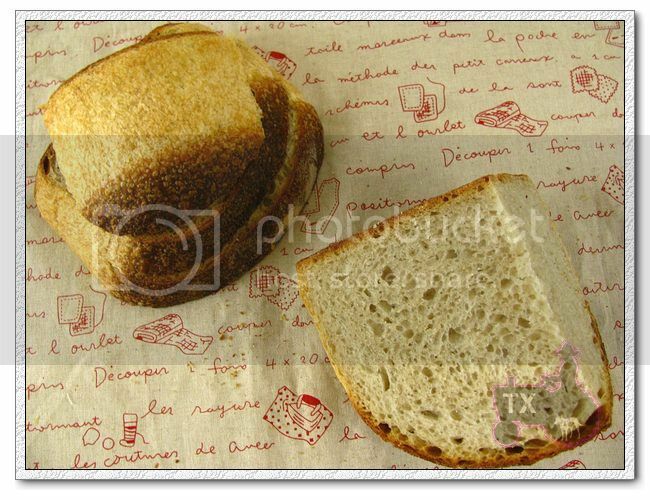 - According to the articles: the bread is made from "beer hops liquid natural starter", not commercial yeast, which brings sourness and "beer taste" to the bread. I am assuming the "hops liquid natural starter" is a "barm", either traditional ale beer barm or simply liquid natural starter with hops added in. For my version, I simply used the barm starter I created last time with Dan Lepard's method (see details here). 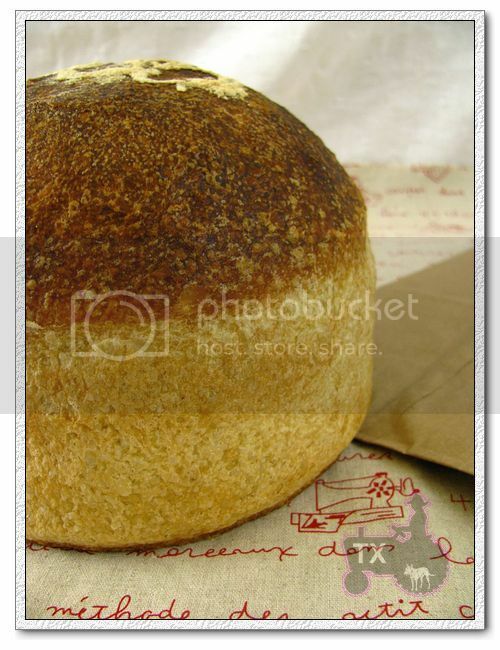 - Various articles mention that the bread went through a 3 stage fermentation process. 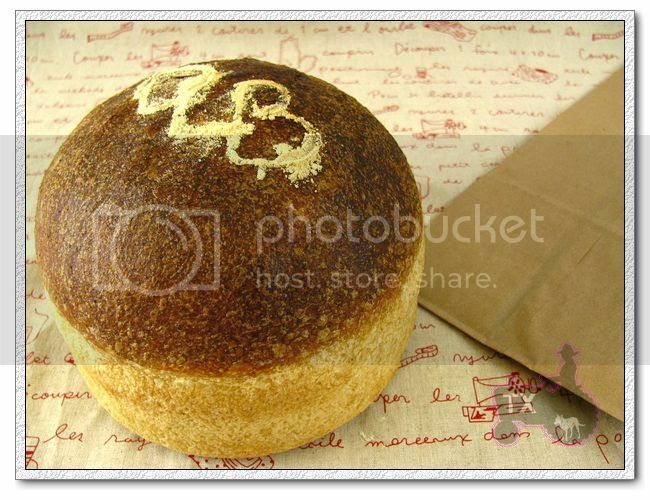 To mimic that, I used the miche forumla in "Advanced Bread and Pastry" which also use a 3 stage fermentation. Hoewever, my fermentation timeline is a little different from what they do for 大列巴. Their total fermentation is 16 hours, while mine is 24 hours + an overnight cold proofing in the fridge. It fits my schedule better, and makes the bread more flavorful IMO. - The ingredient list for 大列巴 reads: flour, salt, water, beer hops, so I am pretty sure it's a lean dough with no sugar or fat, but I am unsure what kind of flour they use. Traditional Russian breads would have a high percentage of rye, but judging from the pictures, and people's comments on flavor, I think there is very little rye flour, if any at all. 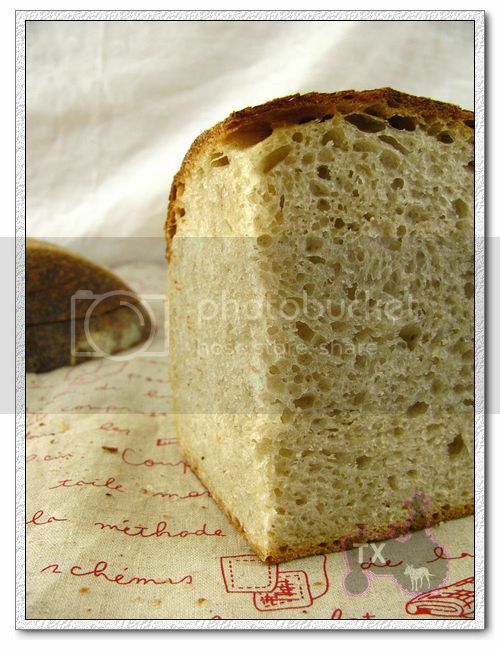 This is reasonable since rye flour is not easily or cheaply available in China, plus local people would much prefer the taste and color of white flour. I used a little bit of rye in the final dough, and KA Bread Flour for the rest. - It's baked in a traditional brick oven (which is again very rare in China) with high heat, and the breads come out of the oven with a hard and crackly crust. That one is easy - I simply baked it on my baking stone like a miche. - Each 大列巴 weights 2KG, about 8 to 10 inches round. I scaled it to about 1KG, 6 inches round. 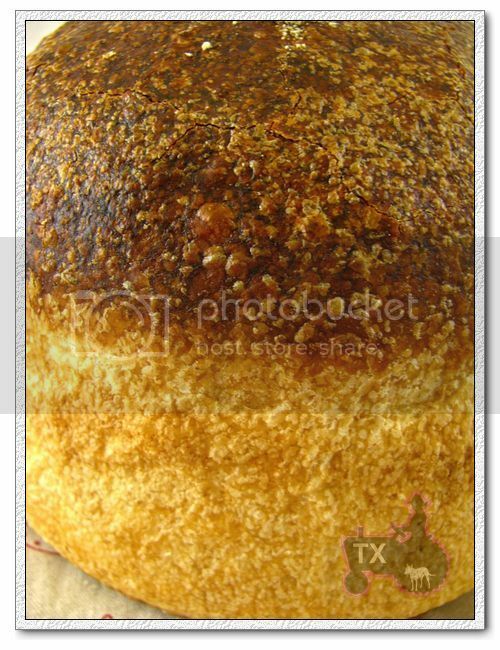 From the pictures above you can see there's a softer/lighter colored portion around the sides of the bread, I think it's because they bake a lot of them in each batch, so breads grow into each other, the areas that touch don't get a hard crust (sort of like a pan of pull apart buns). Even though I like a good crust, to make it look more authentic, I baked the bread in a bottomless mousse ring, to get the light colored softer sides. 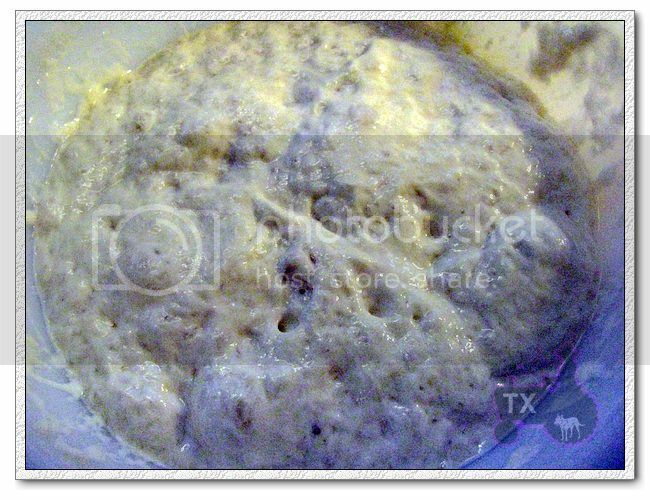 When I used the barm starter, it had been in the fridge for 3 days, but it raised the two starter doughs and the final dough like a bat out of cage. When I loaded the final dough into the mousse ring, it's about 60% full, after 10 hours in the fridge, it has went over the rim of the ring. I was afraid I had over-proofed the dough, but it kept rising in the oven, crazy oven sping, that barm starter is STRONG! Crispy and crackling crust on top, and soft sides, just like the real thing. Since I do like crust, next time I will skip the mousse ring and just bake it free form. Nice and chewy crumb. Just like the real thing, there's no big holes but thats expected with the lower hydration, and how the dough handled in the process. It's noticably sour, very flavorful, crumb is chewy and moist, one of the best miche breads I've made! I've only had the authentic 大列巴 once, many years ago, but I think my version is pretty close in flavor. Next time I will use high extraction flour intead of white flour, and increase the ratio of rye, that will match my current taste preference better. 1. mix and cover, fermentate for 16 hours. 2. mix and cover, fermentate for 8 hours. Mine became so very light and bubbly. 3. mix and knead until medium gluten developement. 6. next morning bake directly from fridge, 440F with steam, 50min. Fascinating historical account, and an exciting looking bread I can't wait to try. Great detective work! I am beyond impressed, Txfarmer! You did an outstanding job recreating this masterpiece! My life has been so frantic lately, I haven't baked a loaf of bread in almost a month, it's killing me! Beautiful post txfarmer. From a historical perspective and as an artisan baker you have done good service to the memory of the originators of this style of bread. On the last post you were saying how hard it is to find rye flours in the stores. I think that is the case in most of the US. I have had the best luck using the fresh ground Rye from Country Creations (flourgirl51). The fresh ground flour is very flavorful and worth getting. Her prices are low enough that the shipping doesn't hurt. When I need dark rye I like the fine grind dark that Stan has at NY Bakers. Also excellent flavor. Thank you so much for the rye resources. I am leaving for summer vacation this weekend, when I come back I do plan on ordering some online. This is getting ridiculous - in the past month, rye has disappeared from all the grocers it seems. Just when I am starting to get into pure sourdough rye! 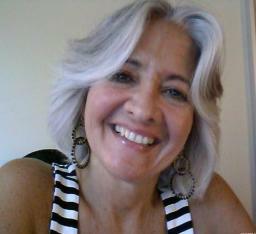 I always learn so much from you. Very impressive detective work to puzzle this loaf out. Your crumb is gorgeous as always and the top crust looks great. Thanks for sharing! I love it that you are helping preserve and resuscitate a historical bread recipe, especially one that yields such a magnificent loaf. I am adding it to my list of must-try breads. Dear txfarmer, I've read with great pleasure your post. For some reason I didn't seen it before today. Being a Russian by my birht, I was understandably attracted by your story and by the mention of Harbin. Now I'd like to reconstruct another part of this fascinating story, to try to understand which was this Russian хлеб - khleb (bread) that the Chinese population of Harbin liked and adopted. Your bread's shape reminds that one of the Ukranian palianitsa (you can see this bread here: http://patenty.info/video-recepti/vipe4ka-video/991-palyanica-kievskaya-po-sovetskomu-gostu-video-recept.html), so palianitsa is one of the pretendants to be the ancestor of the Harbin bread. But, at the same time, in Russian and Ukranian houses many wheat breads were baked in this particular shape, becase they were baked in stockpots. A stockpots is is always at hand in any household and people used it as a mould for bread. I still remember that my first bread was baked like that, because it was baked with a recipe of an old lady, which always baked her breads like that. May be the ancestor of the Harbin bread was a purely wheat bread, without any addition of rye flour (I remember more white bread baked in this shape that the rye ones). In Russia we have a rich tradition of purely wheat breads, the "white breads" which are so popular as the the rye breads are. Usually people eat the "white" bread and the "black" (rye) bread at different meals or with different dishes (I would eat a rye bread with the borsh, a beetroot soup, but a piece of white bread would be a good company for a fish, for example). The wheat breads weren't very often made with the help of the Sourdough starter. In the past many Russian bakers thought ( and their German colleagues would agree) that "white breads" don't need the acidity of the sourdough. So they were made with the yeast. But in many occasions the yeast was made at home, using the hop plant, Húmulus, which is also used for making beer, which explain some words from your recipe. And tradionally Russian wheat breads were made with a long time (at least, 5 hours in the warm enviroment or 8-12 hours in the cold one) poolish. The aim of this long inicial fermentation was to allow the growth of the lactobacilic bacteria in order to give a deeper flavour to the dough. For the same reason, the old dough was used many times at the same time as the poolish. In the past Russian bakers loved the procedure of what in English speaking baking world is called Tang Zhong, the water roux. In some Russian baking books one can find descriptions of different variaties of the Tang Zhong. In Russia and Ukraine people especially appreciated a very soft and even holed bread crumb (here you can appreciate it in the third photo: http://hlebopechka.ru/index.php?option=com_smf&Itemid=126&topic=153667.0). The Tang Zhong was one of the ways of getting this kind of structure. Another way, according to some Russian bakers, to get was is to have two bulk fermentation, meaning to kick down the dough after the first one. Added to a poolish, this gives the three fermentation that your recipe mentions. Of course, my reconstruction is only a hypothesis, lacking a scientific accuracy. I've only tried to imagine the original Russian bread on the ground of what you said about its Chinese descendant and of what I know about the bread in Russia.